February, known for its campfires and fireworks. This morning's Content Update to Fortnite v7.30 held no real surprises, but its new items are weirdly out of season, so it's still bizarre enough to be a proper Fortnite update. As foretold in yesterday's prophecies, Battle Royale received a new Bottle Rocket weapon, along with naturally-occurring campfire locations. Bottle Rockets are a sort of grenade/mortar hybrid, in that they're thrown like a grenade, but launch rockets in an arc like a mortar. Throwing the item places a bottle rocket launcher on the ground, which fires 45 rockets in an arc for "roughly 9 seconds," according to the full patch notes. The item cannot be stopped or adjusted once it starts firing, just like real bottle rockets. Each of the 45 individual rockets does 40 environmental damage and 10 player damage upon impact, which seems tailor made for demolishing large enemy fortifications. That's a total of 1,800 environmental damage per deployed launcher, which ain't nothin' to sneeze at. Bottle Rockets drop in stacks of two and can be found in chests, vending machines, llamas, supply drops, or just lying around. Players can carry a maximum of six at a time, but can only activate two at a time. A demonstration of the new weapon's functionality can be seen in the video below, where a vicious gang of hoodlums commit arson against a respected local business owner. Meanwhile, Foraged Campfires around the island can now be activated to create a temporary healing aura. As with Cozy Campfires, Foraged Campfires heal 2 health per second for 25 second, and can only be activated once. This is inconsistent with real-world campfires, which can be used many times over if the fuel is replenished, but we're just Webelos so what do we know. 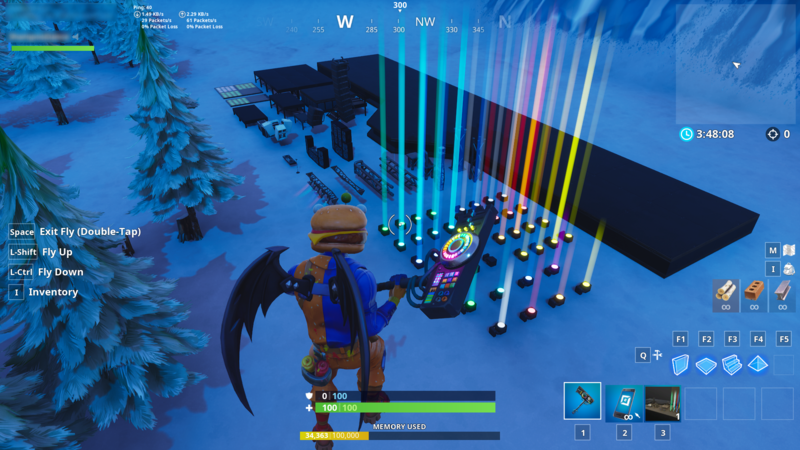 Over in Creative Mode, the giant stage assets used for last weekend's Marshmallo concert have been added as a new prefab, listed near the bottom of the inventory as "Disco Gallery B." Other than two small light-up floor modules, the majority of the gallery is concert pieces, so we're not sure why they named it that way. Anyway, if you need a good disco album for inspiration, Feist's Let It Die is secretly the best disco record of the last 20 years. If you're building your own EDM festival stage, we recommend Awake by Illenium. It'll get you where you need to go. And them's the haps! For details on bug fixes, UI changes and other ephemera, click on that full patch notes link above.